Restored Figural Panel. Attributed to Elihu Vedder. Since 1975, we have collaborated with architects, interior designers and private clients. Sometimes, we are asked to evaluate existing stained glass windows to determine their overall condition and to provide recommendations for proper maintenance, repair, restoration, conservation or external protection. 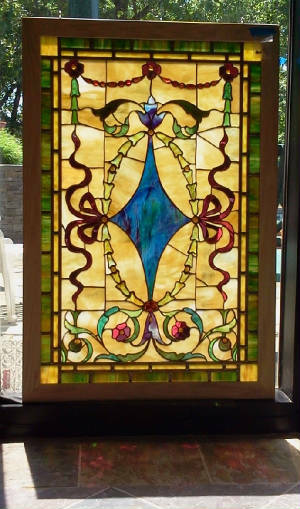 Addressing the needs of an older stained glass window requires meticulous skill and can vary depending on the level of damage and restorative work required. Some projects can be completed within a short period of time. 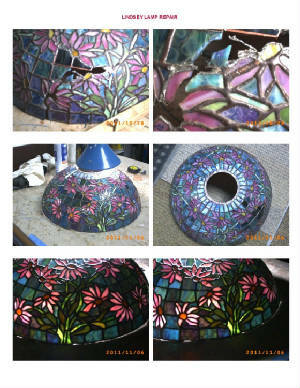 Others may take longer due to detailed documentation, special handling, preparation and locating or custom making glass that matches the older pieces in the panel. The design of the panel above, is titled "MORNING" by Elihu Vedder, who designed mosaics for Tiffany studios. (circa 1890's). This magnificent figural panel was fully restored in our studio in 2010, and reinstalled at the clients' residence into a new thermal pane frame especially designed for it. This panel has painted sections that are broken and missing glass pieces. 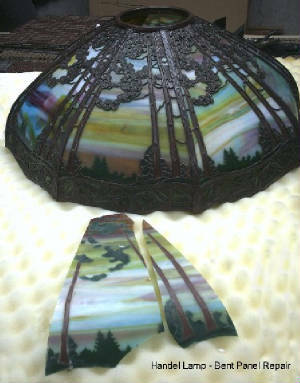 The original painted glass that was broken and salvagable, will be retained. New painted sections (hair) will be added during the repair. 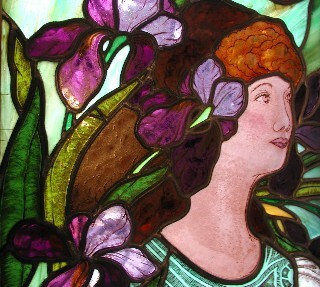 The brown hair (lower section) on this panel was expertly painted and fired by stained glass painter -Indre McCraw (NYC). 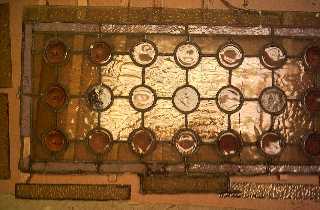 The panel was reassembled using new lead where required. 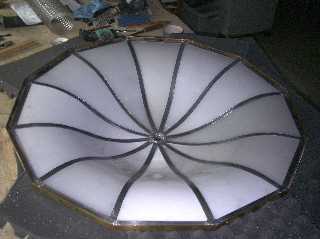 After a pattern has been made of the damaged panel, the window is carefully taken apart, cleaned and reassembled. Broken or missing pieces are replaced and matched as close as possible with glass that is manufactured today. Sometimes, we have surplus glass from old windows which we take apart. 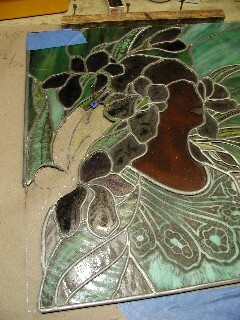 The glass is catalogued and may be reused on other repair projects. No two projects are ever the same. Time estimates for repairs are never easy as each project has it's own inherent issues that must be first analyzed to determine the correct 'next steps'. Proper repair or restoration work can seldom be performed in place. 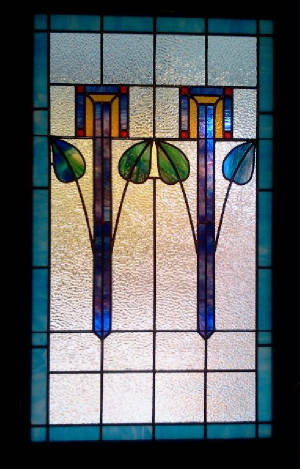 The stained glass window is brought to the studio where the repairs can be executed under appropriate conditions. At times, the greatest obstacle is getting the damaged panels safely out of the frame - without further damage - so that the repairs can be addressed. 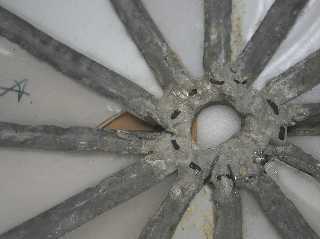 Once lead has deteriorated or separated beyond repair, a releading of the entire panel is required. 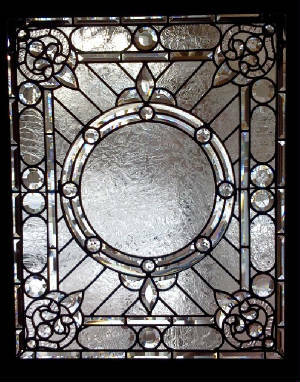 Many older leaded glass windows have reached an age where they require attention, evaluation and repairs or restoration to maintain them properly. Addressing problems early will ensure that these windows are viable for many years to come, while adding value to a residence, commercial location, or house of worship. Old window,on the worktable, for evaluation. We salute the stained glass craftsmen of the past for much of the repair work out there today. They were prolific in the past century, however many of those windows are showing their age, and in need of some repair to bring them back to their former beauty and stability. 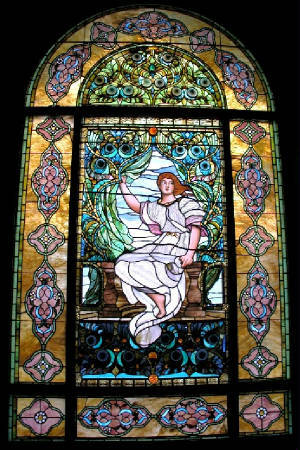 In addition to religious institutions, fabulous examples of stained glass art were produced to enhance homes and buildings. The releaded panel. Most of the old glass was preserved. 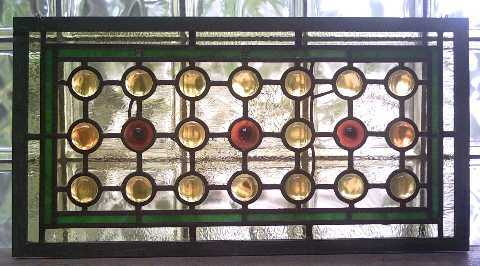 The internal border glass was replaced with a new color at the request of the owner. The window is now ready to hang as an autonomous panel in the home. 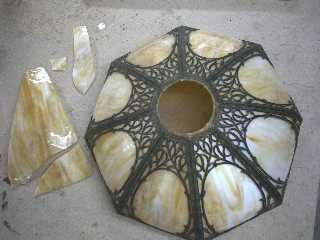 This is the lower portion of a 1920's large chandelier (30" diameter). 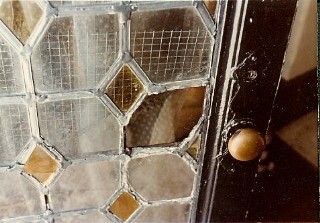 The broken glass and deteriorated leading require restoration. Releaded section. Ready for reinstallation. The final stage is puttying the leaded panel to waterproof it. It is now ready to be reinstalled. Replaced broken bent panels to this antique Handel Lampshade. 4 Bent panel replacements were made in a kiln and then installed to replace broken or missing panels in this brass filigree lampshade.